It is the Age of Rebirth, thanks to the discovery of a new type of catalytic energy and the special individuals who are able to exploit it. These rare individuals, known as Catalyst, use this energy to act together in a sort of interconnected network. Can you make the most of their superhuman abilities to lead your city to fame and fortune? -Take a number of coins equal to the highest cost visible on the Catalyst cards displayed on the board. 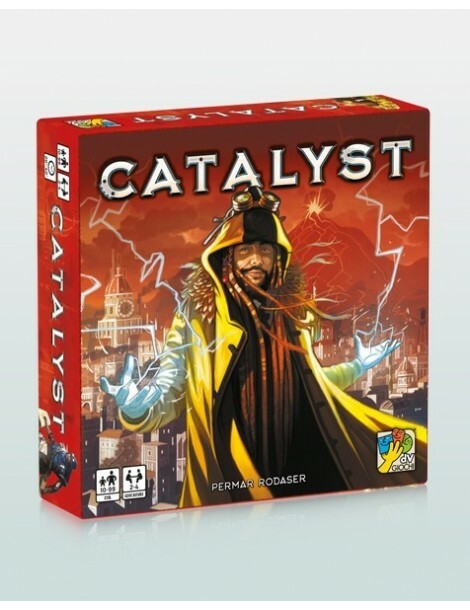 -Pay the indicated number of coins to recruit one of the available Catalyst cards on the board. The cost is altered by the current position of the card on the board. Once recruited, you can put the Catalyst card in one of the buildings you have managed to build. -Activate one of your recruited Catalyst cards to perform its effect. 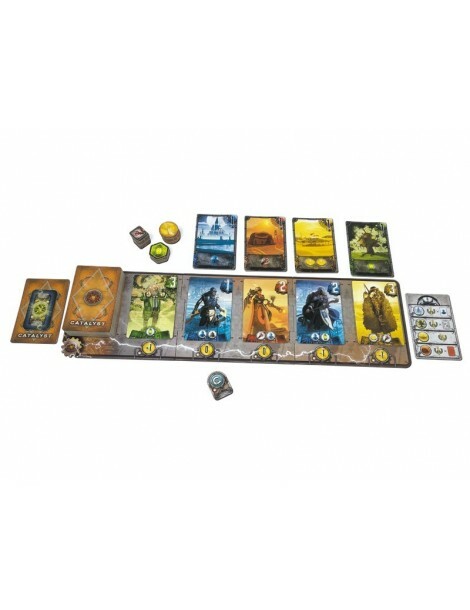 These will provide you several bonuses and actions like gaining extra coins, building new buildings, recruiting other catalyst cards from the board, obtaining military power tokens which will score for majorities at the end of the game, or allowing you to immediately activate other Catalyst cards. Whenever you activate a Catalyst card which is located in one of your buildings, the building provides an additional effect. 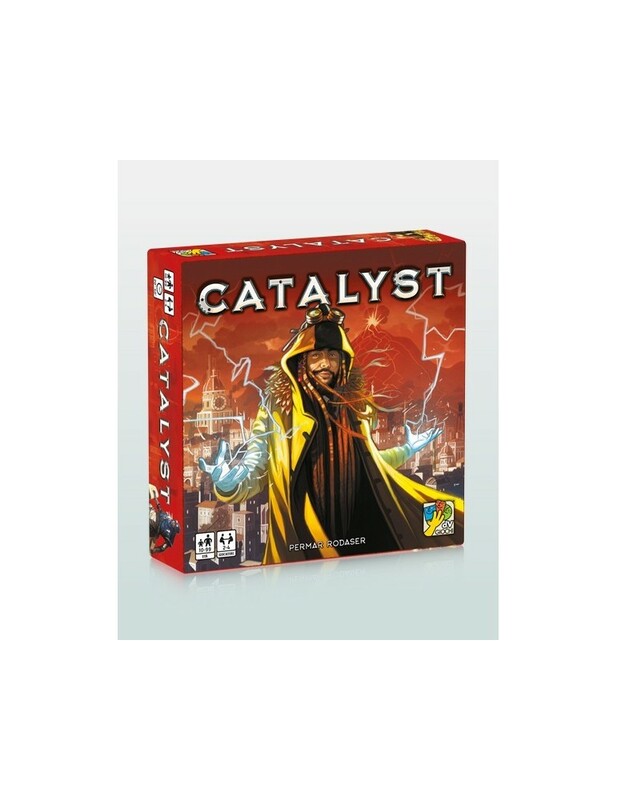 Activated Catalyst cards go into your scoring pile, while buildings always remain in front of you. Buildings are also extremely important due to the fact each additional scoring indicated on the Goal card is related to a specific building; this means that you can score for it only if you first have managed to build that building. 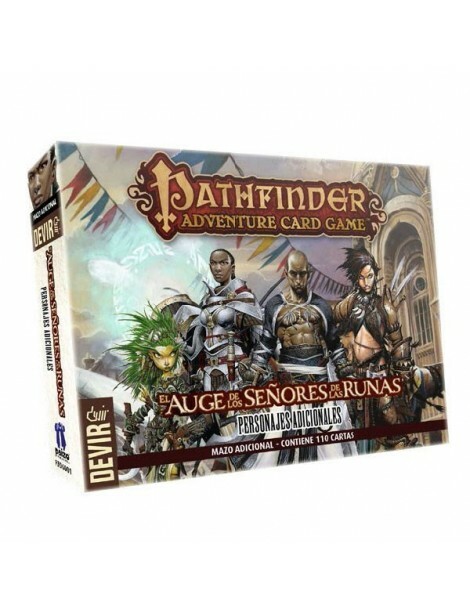 When the deck runs out of cards, there is a final round and then the game ends: players score points according to the Goal card as well as for the majority of Military power tokens and activated Catalyst cards. Whoever gathered the most victory points is the winner.